On how people make decisions under conditions of uncertainty. And the notion of ‘rationality’. 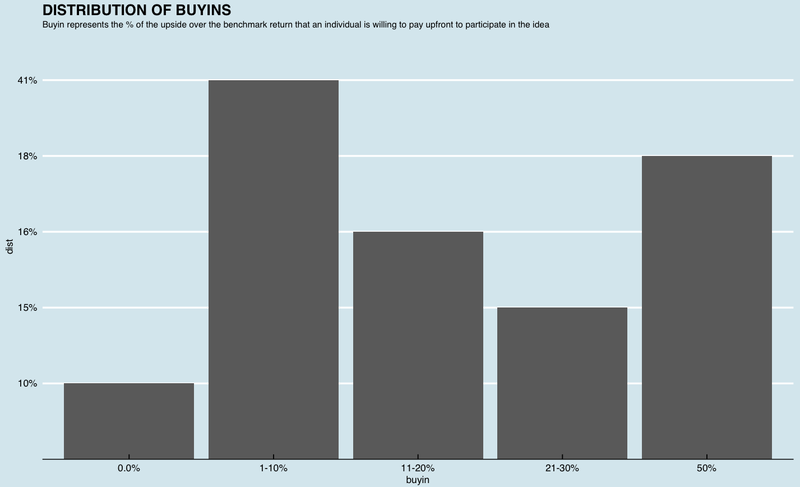 Buyin for ‘50%’ represents 50% and above. Participants comprised of finance and non-finance backgrounds. The left bins generally had finance people; who opted for some variant of upfront fee and profit share structures. Many non-finance guys populated the higher bins. Interestingly, several finance folks populated the 50% and above bin. And I had some friends who were steadfast in populating the left most bin (no excess return propositions for them!). This outcome may strike as an instance of irrational behaviour. Why would anyone be willing to share such a large portion of the excess return? When faced with an uncertain future outcome (100% return over respective benchmark return), participants quoted figures that seemed to make sense to them. The higher bins had a common thread of trust equating to a higher upfront buyin. Some of us are willing to take punts on iffy prospects, as long as someone non-iffy is handling our money. Take away the trust, and the upfront share dwindles quickly. Now assume I ran this game with each participant being able to see the average buyin number. In such a setup, the right bins would castigate themselves for quoting high figures and wish to lower their quotes. The zeros would perhaps bump up their quotes, or stand to lose the opportunity of participating in the game. Further, if this game was an English auction, with the highest bidder winning, it is anyone’s guess where the winning buyin would settle at. Now consider this line of thought. If my minimum required return benchmark was, say, 10%. A prospect offers a 20% return potential (100% over my benchmark). On the excess 10% return, I should logically be content with 1% share for myself (excess return = 10% multiplied by my benchmark of 10%). I should be willing to share 99% of the excess return! I would outbid everyone andmake more than my benchmark return of 10% (10% + 1% share for myself). Most of us would find this line of thought quite ludicrous. In competitive markets, however, such behaviour tends to set prices. The marginal investor(s) with the lowest return expectation sets prices. The investor with the lowest return expectation would push prices to levels where they make their minimum required return. If my required return was higher, I would have to sit out of bidding. Until prices dropped to levels where I made my required return. Since I cannot see the average return expectation of the market as a whole, I would have to get creative if I desired to continue participation. (1) I could find new avenues not seen by others; (2) lower my hurdle rate, (3) get fancy about ‘fair’ value assessments with some creative jugglery, so it all begins to ‘make sense to me’. (1) is difficult to do on a sustained basis (which is why anonymity is such strong currency in investing). Generally, the markets find it easier to indulge in (2) and (3). (3) has the highest amusement value. A closing tale on probabilistic thinking. Those of you that had the (mis)fortune of crossing paths with Abraham de Moivre in school probably missed peering into his queer life. De Moivre is vaguely remembered for his namesake formula that forever married trigonometry and complex numbers. However, his biggest contribution, arguably, came in the area of probability. De Moivre penned a book – The Doctrine of Chances – in 1718. This book has the distinction of being only the second book ever written on probability. Gamblers loved it in the 18th century; many love it to this day. For reasons best known to him, de Moivre also delved into the morbid subject of mortality, and came up with a treatise on estimating the value of human lives. This blasphemous pursuit was then used to price annuities upon those lives. In so doing, he provided a platform for the creation of the business of Insurance. He predicted the date of his own death. Perhaps bored after a long and eventful life, de Moivre took to sleeping 15 minutes extra each night to fill up his day. He predicted that if he continued this chore, he would die on November 27, 1754. The day came and passed. So did de Moivre. Probability had won. de Moivre had won too. But couldn’t hang around to celebrate. (The story of his death may be apocryphal but one must not let such trivialities destroy a good expiry story). The buyin game shows that we desire a large share of outcomes with return prospects far higher than our required targets. We also desire to keep for ourselves a large share of outcomes even if we had little to contribute in achieving those outcomes. How many of you are ready to play Abraham de Moivre and predict if such behaviour is greed, or folly, or (ir)rationality?